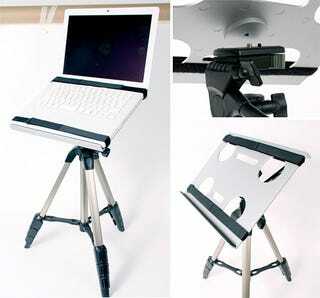 Laptop Tripod Stand—Because Why Should Cameras Get All The Fun? I can visualize several uses for this laptop tripod stand from Thanko: bedside movie watching; displaying online sheet music for trombonists; PC/camera tethering. Or, my ideal usage—watching Entourage episodes while in the bathtub.